Judge Richard Skelton issued his ruling around 1:30 today. I was on an airplane headed back to Cincinnati from a quick trip to Tampa. I went live on Facebook from the airport, and then spent the trip back to Dayton talking the case over with friends who know mire than me, and calling the Ohio Attorney General’s Open Government Unit. The decision was a split. I won on the major issue of if the task force was a public body and had to comply with the Open Meetings Act. That was a major hurdle- after the amount of BS the defense threw at the Judge claiming it wasn’t. 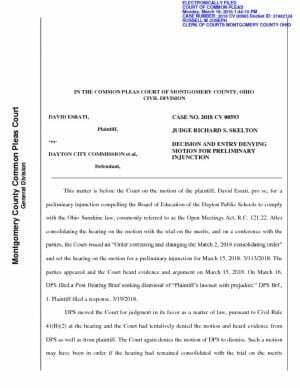 However, the judge refused to offer a temporary injunction banning the board from acting on the school closings because he said I failed to prove that the bus tour engaged in deliberations. First, how could I tell the judge what happened in a meeting I wasn’t allowed to attend? And, second, since the issue wasn’t subject to the privilege of executive session, the meeting was illegal. But, Lolli said on the stand, they just observed and got briefed. The Judge created some kind of third kind of meeting- that isn’t defined by law- of an “information gathering session” which he thinks is exempt from public scrutiny. Here he makes an error. The contents of a meeting that isn’t open- and isn’t covered by executive session rules- is illegal. Period. (if any of you want to transcribe her lies, and put the time code of what she says and put it in comments- I’d be very appreciative). The remaining members of the task force briefly toured Valerie Elementary’s kitchen, gym/cafeteria, mechanical rooms and one classroom that was not in use. At 52 years old, Valerie is one of the few schools that pre-dates DPS’ building boom of last decade. Lolli and associate superintendent Sheila Burton gave task force members detailed data on where the students attending each DPS school live, to show population concentrations, and how many students are traveling across the city each day. As the task force headed back to the bus, Lolli told the group that legal counsel for the school district had advised the task force to stop the remaining school tours. members asked questions seeking clarity on the data. But the task force members did not leave the bus, and eventually returned to DPS headquarters. As far as did they violate the law- it’s obvious they did. Why the judge refuses to stop them from adopting resolutions based on illegal meetings is beyond me. The board is also trying to hastily hire Libby Lolli tomorrow night at 5pm. I highly recommend all of you come out and suggest that they haven’t done their due diligence or provided the public enough time to review the contract or the terms. Hiring a superintendent in the midst of turmoil is exactly how the last bad decision to hire a superintendent got made. This whole situation stinks. Thank you for your continuing effort, David. I agree that it was quite clear when you were excluded that it wad because they didn’t want you specifically reporting on the meeting, and because you were excluded from observing it was not an open meeting and none of yhe decisions made in their secret meetings should be valid. An injunction should have been been included. Please appeal for us, and thank you again for all you do to try to keep our governance in the schools (as well as elsewhere) clean, open and transparent. These people have not the slightest clue what they are doing. And now David Esrati knows more than a judge – who has studied the law. I’m just continually at a loss with what his end game is. Well, I take that back, I know what his endgame is and it’s wildly unbecoming of an adult that could, potentially, be observed by the youth of this district. And before anyone charges to his defense, go watch his YouTube video with the library guard. Tell me that is the altruistic, selfless person that is suing a school district. I’m disappointed in you, David. You do not represent me, and you do not represent the Dayton community I know. It’s unfortunate because somewhere, buried in all your ego, you probably do have a few good ideas to help the district thrive. Unfortunately you have such little credibility because of these continual stunts. The flaw of course is if secret meetings take place they aren’t going to admit it or tell you what was said. Doesn’t work that way. The good judge was looking for a way not to disrupt the process. It was a case he did not want. That is how this twisted ruling came to be. If a majority of a board meets, even for beers at a bbq, there are serious problems with the Sunshine law. Most jurisdictions know this and respect it. It stretches credibility to the breaking point to think discussions, formal or informal, were not taking place on the bus. It is human nature to talk. Basically those who wanted to come for the ride should have been invited as seats were availible. In court the truth doesn’t always prevail. Score one for the liars but cheer on the home team.